It was the beginning of the hiking year and we decided that a really big trip through some 4000 footers was in order. So we put our heads together and thought that a trip over a couple of the northern Presidentials was the perfect way to begin the hiking year. After all, we reasoned, the weather should be cool, the crowds light, and the bugs scarce. 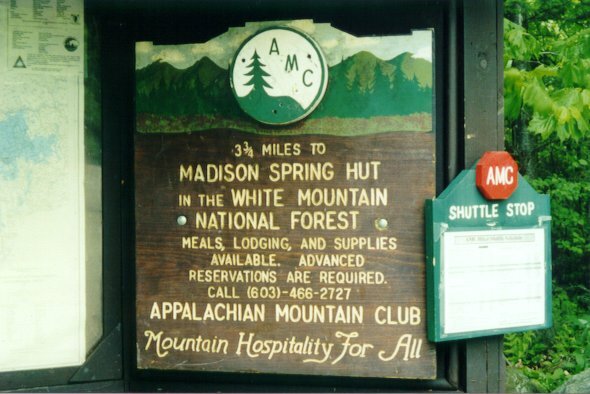 In addition, since we have never talked about the AMC Hut experience, which is so central to the whole White Mountain experience, we thought that this would give us a perfect opportunity to stay at and review one of the huts, in this case, the Madison Spring hut. We were right about all of these things, but the White Mountain weather had a few things of its own to say about our plan. Start @ Appalachia Parking Area on Rt. 2. This was an ambitious plan to say the least. We knew that the weather in June could be unpredictable, so we knew that we would have to bring the proper clothes and equipment to handle anything from 70 degrees and sunny to 30 degrees and raining. All with a 50 m.p.h. wind. 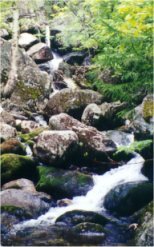 As you will read on, you will discover the moral of this story is that in the White Mountains things don't always go as planned. What follows is our day-by-day account. Temps in the 50s. Partly cloudy with a chance of afternoon thunderstorms. Lows in the 40s. Winds light to moderate. We arrived at the Appalachia trailhead around noon. This was OK according to our plan, since we intended to make this a light warm-up day and hike in only a few miles to find a campsite for the night. The Appalachia parking area is easy to find on Rt. 2, about 4 1/2 miles after Gorham on the left side of the highway. There's plenty of parking (during the week - may be crowded on weekends) and it's well marked and centrally located to all of the major trails on the northern side of the Presidential range. We loaded up the packs (which were approaching about 50 lbs.) and headed in. The weather good with temps around 60 and only a few clouds in the sky. There was a light breeze, although not enough to keep either the mosquitoes or the blackflies away. The Ben's 100 came out almost immediately. The trail crosses an old railroad bed just after the parking lot and moves slowly and steadily uphill on a well-graded and not-too-rocky path for about a quarter mile. If you are planning a trip in this area, pay close attention to the signs, for many trails converge in a small area here and it is easy to get turned the wrong way if you're not paying attention. However, the Randolph Mountain Club maintains the trails in the area and does an excellent job both keeping them clear and keeping the signs up-to-date. 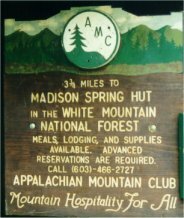 An important note, however: many of the trails in this area have been re-routed or added since the last round of topographic maps were published, so the AMC White Mountain Guide and maps are a must for an up-to-date picture. The entire area is covered on the AMC #1 map - Presidential Range. A couple of different trails out of the parking area lead to both Snyder and Bumpus brooks, which put 5 different waterfalls and pools within a very short 1-3 mile hike from the car. 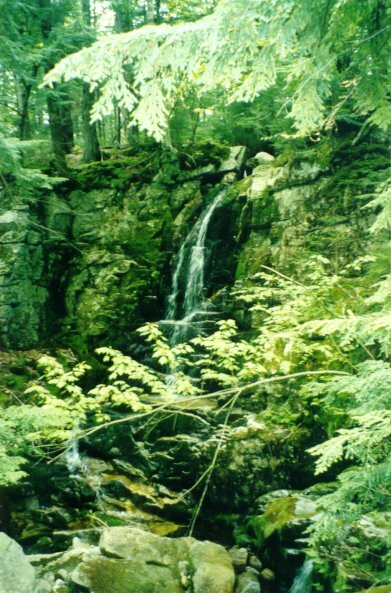 We took a quick trip up the Valley Way trail to Salrok Falls on the Snyder Brook for the photo-op and then backtracked to the Sylvan Way and headed east. 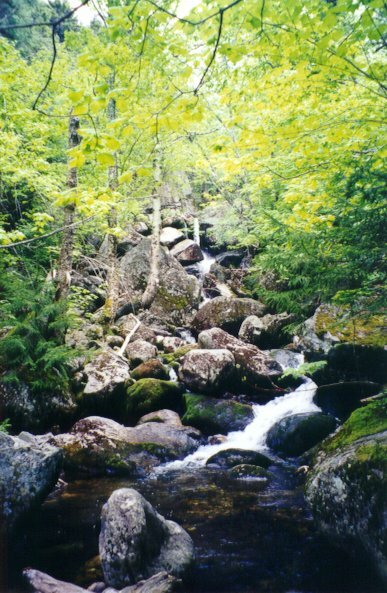 The Sylvan way leads towards Bumpus Brook, to Coosauk Falls and Hitchcock Falls without too much climbing. After Hitchcock Falls the trail gets a little steeper and the fun begins. The trail is a little easier to follow than the description in the White Mountain Guide would have you believe, but it does cross some old logging clear-cuts that are overgrown with low brush. When the deciduous trees are in full leaves and the low brush is too, I can imagine that the path may be difficult to distinguish at times. It's not too bad, but something to keep in mind if you have a tendency towards losing trails or getting lost in your own back yard. We headed towards the Blueberry Ledge, which, incidentally, has few blueberries and isn't much of a ledge. There's an interesting rock formation on the right side of the trail called the "Bear Pit" which is basically a big hole in the rocks that looks like it would be no fun to try and climb out of should one find themselves at the bottom. We continued about a half mile beyond this and found a moderately flat area where we could set up the tent. By this point the sky had clouded over and the wind was picking up so we decided not to tempt fate and took the site. It yielded a new bungee cord that someone had conveniently left wrapped around a tree. This would come in handy later. When we started setting up camp, about .2 miles south of the Blueberry Ledge, it was about 4:30 and the sky was looking darker and the wind was getting stronger (insert somber foreboding music here . . . ). There are not many areas along this trail that provide a spot suitable for setting up a tent of any size, and we were sharing Chris' Peak 1 Orion. This is something else to keep in mind: tentsites are always very difficult to find in the White Mountains - especially as you get higher in elevation. We've learned to be very flexible with our daily distance goals, always trading a few tenths of a mile for a good tentsite. We got the tent staked out and stuff under the vestibules just as the first of a few showers passed over. Nothing that would get us soaked or anything, but enough to be annoying. As we relaxed in camp, the winds got steadily stronger until we decided around 6:30 that inside the tent would be a better place and we crawled in for the rest of the night. We staked everything down tightly because the winds sounded like they were really howling and we broke out the books to read for a couple of hours until dark and it was time for sleep. The winds kept up all night, really rattling the tent. This made it so that we only slept in 1 to 2 hour bursts, as the wind was loud enough to wake us up periodically. The found bungee was put to good use as an extra guyline for the rainfly on the tent to help secure it from the wind. As we crawled into the tent it seemed to be getting colder - dropping into the low 50s or upper 40s. We expected it to drop into the 30s. But when I was awakened at around 10:30 by the wind and left the tent for a "midnight relief mission" an amazing thing had happened. It was warmer! It was like t-shirt and shorts warm. Unbelievable. A warm front had apparently come through. This would play a critical role in the next couple of days. 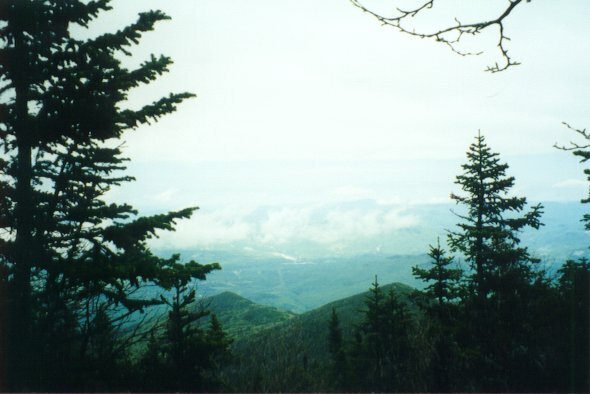 Actual conditions on the higher summits 6/8: High temp: 55 degrees. Peak wind gust: 69 m.p.h. Temps in the 50s. Partly cloudy with a chance of afternoon thunderstorms. Summits in and out of the clouds. Clearing at night. Lows in the 40s. High winds (65 - 75 m.p.h.). We slept as late as we could, and at 7:30 in the morning a little ray of sunshine appeared on the tent walls. We climbed out of the tent and looked around to see the sun coming through the trees for about another 30 seconds. Then it went away. That's the last we saw of it for about 12 hours. (More dark, foreboding music here . . .) We had no way of knowing the forecast that you see above had been updated to reflect the high wind warnings. This would become important later. By the time we had broken camp and hit the trail about 9:30, it was cloudy and raining lightly. The wind was roaring up Bumpus Basin which was to our right as we hiked up the trail. We could hear it but were relatively well sheltered on the trail. However, we could see the clouds were low. The Howker Ridge Trail at this point is not very remarkable. 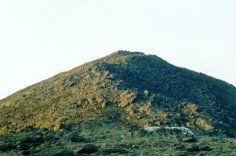 It climbs over a series of three progressively higher bumps called the Howks. Each one is a tough climb in itself, and three in succession are positively heart breaking, especially under a 50-pound pack, while hiking in the rain for 2 hours. Yep, after we left camp, it started raining and kept raining for 2 hours straight. At the same time, the wind kept howling and the clouds didn't appear to be breaking. On the way up the trail stays on top of the ridge and so it reportedly offers good views to both sides, including of Mt. Washington. We've been told that these are some of the best views in the Whites, and the overlooks seem like they should provide great views, but since visibility was only a few hundred yards for most of this climb, we really couldn't tell you what the views were, because for most of the trip we couldn't see a damn thing except dark, gray sky. After the last of the Howks, the Howker Ridge Trail breaks out above treeline. The wind is blowing at 60 m.p.h. Are you guys f*&^ing crazy!? At around 12:30 in the afternoon, the same thought crossed our minds. By this time we were about to climb up the last of the three Howks which would bring us to the point of no return in our hike. Once we hit treeline, we would have to traverse about 1.5 miles of exposed ridge to the Madison Hut. We began to get worried for our safety. As we began the climb up the last of the three Howks, however, two things happened that factored into our decision to continue. First, the rain stopped. Second, from one of the last overlooks we saw some blue sky in the distance. Now, we're not saying that the conditions were great, but they did not appear to be getting worse.